While still nominally allies, the U.S. and Turkey‘s relationship is continuing to fall apart amid new economic penalties in the continued fight over an American pastor detained in Turkey. Andrew Brunson has been at the heart of the ongoing fight after the U.S. sanctioned two top Turkish officials for his continued detention, and Turkey’s vow to retaliate, even as its currency plummets. Even though a meeting between National Security Adviser John Bolton and Turkey’s U.S. ambassador on Monday yielded no public progress, the White House is now leading the talks with Turkey over Brunson’s release and a host of other issues that have dragged down the alliance. A senior State Department official referred questions to the White House and declined to say whether Brunson’s case had to be resolved before there could be progress on other issues. President Recep Tayyip Erdogan announced Turkey’s latest salvo Tuesday, saying his country will boycott U.S.-made electronic goods and turn to other manufacturers including South Korea’s Samsung or Turkey’s Vestel. Doubling down on his standoff with President Donald Trump, Erdogan also called on Turkish companies to produce more of their own goods. It’s unclear how such a boycott would work, and the State Department said it couldn’t confirm “that that is actually going to happen,” according to spokesperson Heather Nauert. Erdogan again urged Turks to convert their U.S. dollars into the Turkish currency — the lira — to give it a boost as it continues to drop in value. While the decline accelerated last Friday after the Trump administration announced new tariffs on Turkey, the U.S. denied responsibility for Turkey’s economic state. “What is happening in Turkey goes far beyond the United States and the United States’ recent policies and impositions of various policies and mechanisms,” Nauert said. There was a clear, sharp drop in the lira’s value on Friday after Trump tweeted he was doubling tariffs on Turkish steel and aluminum, citing a national security threat, and a smaller decline when the U.S. sanctioned Turkey’s Interior and Justice Ministers on Aug. 1. “Our relations with Turkey are not good at this time!” Trump added last Friday. That was a rare Trump understatement, as the two countries face sharp differences on the case of Brunson and other detained Americans, Erdogan’s consolidation of power, U.S. support for Kurds in Syria, growing Turkish relations with Russia, Turkey’s evasion of U.S. sanctions and more. The senior State Department official told ABC News that the two countries continue to work on a broad range of issues. 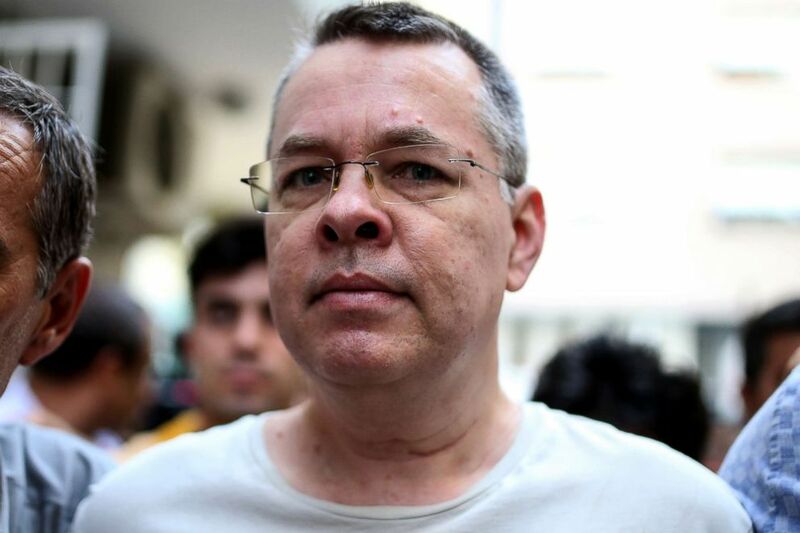 But senior Trump administration officials, in addition to the president, have spent weeks now focusing their demands on the immediate release of Brunson, an American missionary who has served in Turkey for more than two decades. Andrew Craig Brunson is escorted by Turkish plain clothes police officers, July 25, 2018, in Izmir, Turkey. Brunson was arrested during Erdogan’s broad crackdown on political opposition after an attempted coup in July 2016. Charged with espionage and aiding Kurdish militants and a U.S.-based Turkish cleric accused of fomenting that coup attempt, Brunson was imprisoned for nearly two years and moved to house arrest last month. He and his lawyers have denied those allegations, and the U.S. has said the charges aren’t credible. He faces up to 35 years in prison if convicted, with his next trial date set for October. The top U.S. diplomat in Turkey, Charge d’Affaires Jeffrey Hovenier, visited Brunson and his wife, Norine, Tuesday, calling on Turkey to resolve his case “without delay and in a fair and transparent manner.” The more diplomatic line than Trump’s, calling for his “immediate release,” was not meant to signal a change in policy, Nauert said Tuesday. Hovenier also noted that the U.S. is demanding the resolution of several other U.S. citizens’ cases, including NASA astronaut Serkan Golge, convicted of being a member of a terrorist organization in February “without credible evidence,” according to the State Department, and of three Turkish citizens who work for the U.S. mission and have been detained for months.